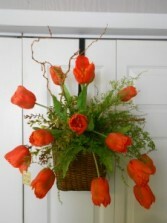 Brighten up your home or a friends home with some bright orange silk tulips arranged in a wall basket. 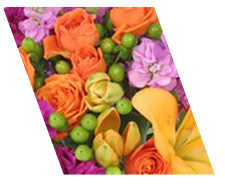 The perfect burst of spring! 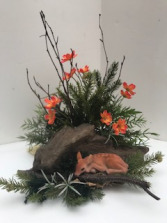 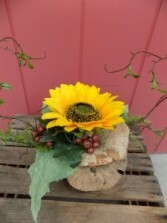 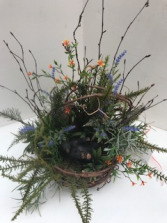 A stylized permanent arragement of a sunflower, mushrooms and berries in a log vase that is simple with a very natural feel. 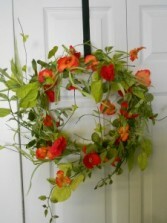 Simple, natural yet gorgeous, this 12" wreath can be the finishing touch in anyone's decor. 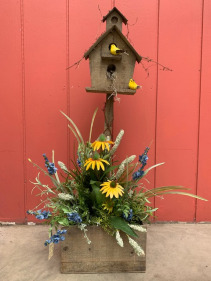 A permanent arrangement with soft shades of blue and green, accented by yellow cone flower. Artificial succulents arranged in a natural wooden box. 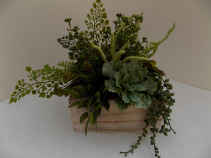 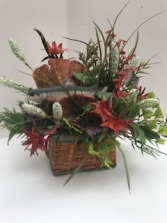 This arrangement is overflowing with artificial green succulents placed in a natural wooden box. 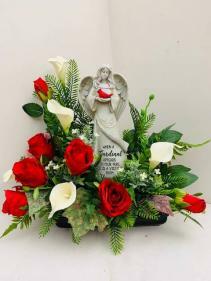 This is a touching resin angel holding a cardinal in a beautiful permanent floral piece in red and white. the Saying "When a cardinal appears in your yard it is a visitor from heaven" is inscribed on the angel. 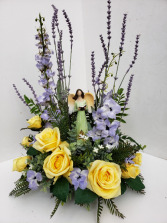 Perfect gift for a rememberance or sympathy. 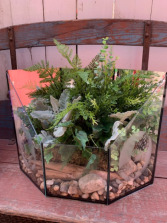 A beautiful praying hands engraved terrarium. Filled with silk plants, stones, and drift wood.